Whatever type of home you have, whether it’s a mobile home, a rambler or a modest yurt in Northern California, it deserves to be protected. But insurance is super-expensive, right? And is it really even worth it? Good news! It isn’t super-expensive. And it is totally worth it. Our independent insurance agents shop and compare policies from multiple carriers to find the right mobile home insurance for you at the best possible price. Plus, they’ll walk you through the entire process, answer questions, and even break down any fancy insurance language into good old-fashioned plain English. But before we go and celebrate, let’s start with a little background on how insurance companies come up with their rates, what kind of coverage you need, and more. It begins when an insurer reviews your application. They look over a number of different risk factors (things like size, location, etc.) associated with the coverage you’re looking for. They add up all the costs tied to these risk factors, add on a little profit margin for good measure and—beep, boop—you’ve got your policy’s cost. NOTE: The cost of your coverage might change over time, going down if the value of your mobile home depreciates, or going up if the financial demands of offering the plan increase. So keep that in mind. What Is Mobile Home Insurance and Why Do I Need It? Mobile home insurance is a lot like homeowners insurance, but it’s designed to specifically cover the unique differences between a mobile home and a site-built home. Since a mobile home is lighter and also secured differently, the risks can sometimes be considered higher, which makes insurance even more important to have in place. Mobile home coverage can help protect you from things like liability issues, property damage, theft/vandalism and even flood and earthquakes. Though you may feel like you don’t need these coverages, any small incident can bring a world of financial hurt your way. The peace of mind alone may even be worth the price. Property damage: Protects your house and the stuff inside it from angry weather and vandalism (though this may not apply if your property has depreciated significantly). Liability: Protects you financially if someone injures themselves on your property (and legal bills can get real pricey, real fast). Natural disasters: Protects you from the worst types of angry weather out there, like floods or earthquakes, which aren't typically covered by basic plans. In all cases, your agent will help assess your situation and come up with the right coverage for you. So tell them all about you, where you live, and what you want, and leave the rest to them, the experts. Simply put, the cost of your mobile home insurance plan will depend on the coverage you need, your home’s location, the size, and the value of your house. But you’re also going to want to talk with an agent about any other unique needs for your situation, and find out if additional coverage is necessary. In general, though, you could be looking at as little as $300/year or as much as $1,000/year—like we said, depending on the age of your home and the overall shape it's in. 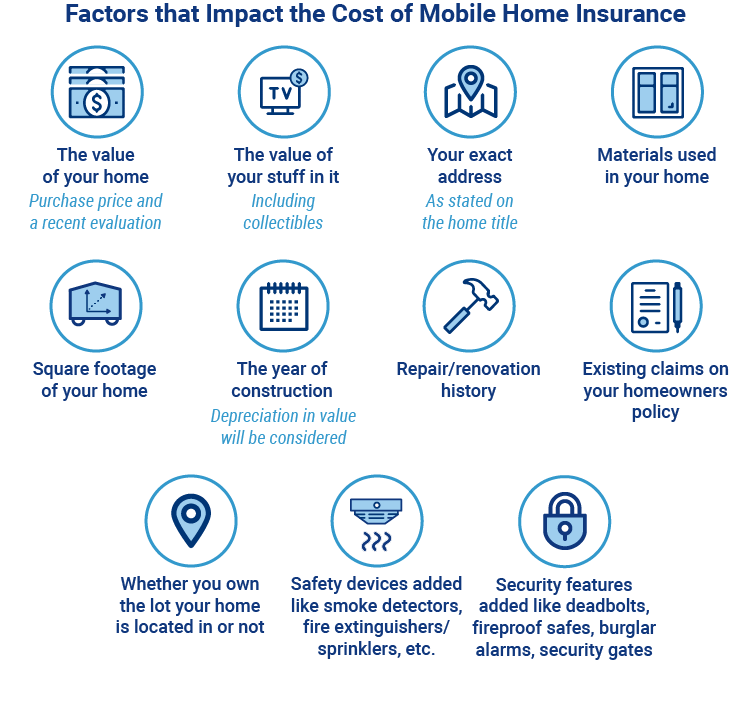 Mobile home insurance costs fluctuate depending on where you live (just like anything else). Florida is notoriously the most expensive state for mobile home insurance since it tends to be on the high end of the crime-and-severe-storms spectrum. Hawaii is on the opposite end—the least expensive state for coverage—due to the massive amount of generally happy people, sunny skies and pina coladas. Comparing policy rates by yourself can be complicated. After all, there are tons of important things to keep in mind and lots of big nuggets to digest. But our agents are here for you, and know everything that's important to consider when comparing rates. An independent insurance agent can make your life a lot easier—at least through this process. Since they're not tied down to one insurance company, they're free to shop, compare and assemble all the pieces of the coverage puzzle for you. We know what you want—quick and easy mobile home insurance quotes in under a minute. We get it, you want the lowdown, A-SAP. However, choosing high-geared speed could mean sacrificing accuracy...which could end up costing you. Plus, our competitors might also sell your precious info to multiple companies, which could lead to a bunch of unwanted voicemails from unknown numbers. We grabbed the mic and gave it to YOU by providing the info and options to connect with an independent insurance agent when the time is right.